DD Form 2704 - also known as the "Victim/witness Certification And Election Concerning Prisoner Status" - is a United States Military form issued by the Department of Defense. The form - often incorrectly referred to as the DA form 2704 - was last revised on March 1, 2013. Download an up-to-date fillable PDF version of the DD 2704 below or request a copy through the chain of command. AUTHORITY: 42 U.S.C. 10607 et seq. ; 18 U.S.C. 1512 et seq; DoDI 1325.07; DoDI 1030.2; and DoDD 1030.1.
be notified about subsequent changes in prisoner status. changes in a criminal offender's status. Court-martial case of United States v.
as required by 42 U.S.C. 10607 et seq., and U.S.C. 3771 et seq. 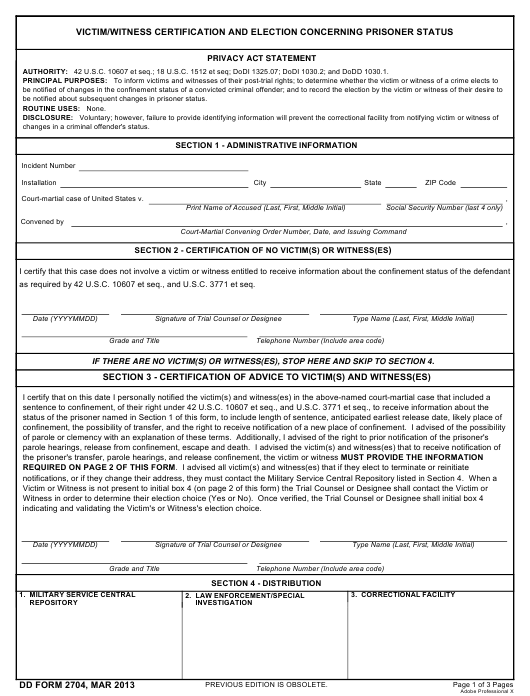 IF THERE ARE NO VICTIM(S) OR WITNESS(ES), STOP HERE AND SKIP TO SECTION 4.
indicating and validating the Victim's or Witness's election choice. receiving notifications on the prisoner's status, if their relocation results in changes to their address and/or telephone numbers. retains responsibility for clemency board notifications. No box in Column 4 for unavailable victims or witnesses. Service Central Repository, the gaining confinement facility, local responsible official, and the victim or witness, if any. Incident Number: Obtained from the DD Form 1569. Installation, City, State and Zip Code: The geographical location of the Convening Authority (CA). Court-Martial Case of United States v.: Add the offender's name and last four digits of his/her Social Security number. Convened By: Add the court-martial convening order number, date, and issuing command. Print Name (Last, First, Middle Initial), Grade, Title and Telephone Number. Add the same identification as the individual signing the form. If there are no victims or witnesses involved in this case, stop and go to Section 4. Forward Page 1 only to the respective Military Central Repository. the Victim's or Witness's election choice. Forward Page 1 and all other pages listing victims and witnesses to the Military Central Repository. A copy of the completed form shall be forwarded to each of the listed agencies. Block 1 - Military Service Central Repository. Add the address for the offender's branch affiliation. Block 2 - Law Enforcement/Special Investigation. Add the address for the offender's branch affiliation. Block 3 - Correctional Facility. Add the location of the prisoner's confinement. Statement of Understanding should be read to the victim(s) and witness(es) when possible. Statement of Transfer Notification should be read to the victim(s) and witness(es) when possible. witness (W), or victim and witness (V&W) in this case. guardian's address (if different from that of victim or witness). parent or legal guardian's telephone number (if different from that of victim or witness). NOTE: Prevent victim(s) and witness(es) personal information from being released to other victim(s) and witness(es). NOTE: DO NOT provide this form to the prisoner. This form (when filled in) is FOIA and PA exempt from release under DoD 5400.7R and 5 U.S.C. relationship. Ensure their loco parentis title, e.g., Parent, is completed after their name in Column 1.
investigative jurisdiction of a DoD Component. When the victim is a minor, that term includes a family member or legal guardian. witness or provide evidence of the crime only assume the Witness status.